This is the largest fluted point recorded to date. It was found on the surface of the ground several years ago by a man working on a ranch in Douglas County, Washington. When he passed away it was left to family members in California where it was stored in a sock in a closet for several more years. It was only after the initial discovery in 1987 and the article in the National Geographic Magazine about the Clovis cache at East Wenatchee, Washington that this Clovis point became known. This Fluted point was found on a high plateau about eight or ten miles from the East Wenatchee Clovis site. It's made from semi-translucent Rainbow Obsidian. Normally it looks black but when it's tilted in the light it turns a shade of sea green. There are also quite a lot of scratches on the surface that may either be from use or transportation. One fairly fresh flake removal is located just above the small finger in this picture of the cast. This Clovis point measures 9 3/4 inches long, slightly more than 1/2 inch longer than the largest Clovis point from the cache at East Wenatchee. 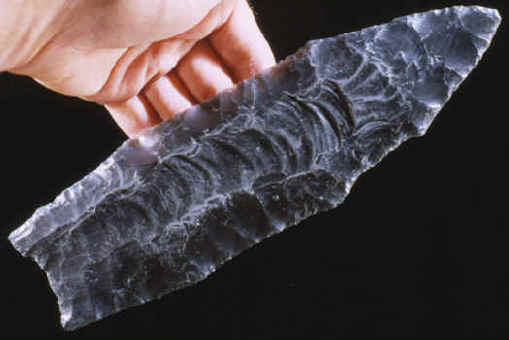 This picture shows the original Clovis point from Douglas County.